Dr. Moelleken feels there are many different problems that can happen with your neck as you age. One is that the muscles become loose, allowing you to actually see the muscle bands that go down your neck. There are two muscles, one on each side, and when the muscles loosen, so does the skin because fat is literally dissolving away from your face. Volume can be replaced in your neck by taking the loose muscle and bringing it together in the center. An incision will be made underneath your chin to tighten the neck but this does not always fix the skin that is loose in the entire area of your face and neck. Instead, it just helps the muscles underneath and sometimes the fat. Dr. Moelleken recommends that for women who do not really need or want a facelift yet, a Neck-Lace is a good choice. In an incision under your chin, instead of just tying the muscles together in the center he ties them more widely, almost in an inner lacing stitch used when tying your shoe. Most of the work of a Neck Lift is performed at the deep, not skin level. Dr. Moelleken feels it is a mistake to resect anything more than a minimal amount of skin from below your neck because it can cause great artifact, which is the exception is the direct neck excision. He prefers the wide interlacing technique for your neck rather than a centrally based platysmaplasty or a transection of the platysma, which can yield a skeletonized appearing neck with visible glands. Patients always wonder which procedure will help the most: especially when it comes to your face. Dr. Moelleken understands the confusion especially when some doctors consider a Neck Lift to be a procedure performed just under the chin and others consider it to be a lower facelift addressing primarily the neck. His focus is to provide the “procedure or combination of procedures that will give his patient the BEST result.” In his opinion, your best result will come with a combination of two procedures: one to tighten your neck muscles and deeper structures and the second to reduce extra skin through incisions behind and around your ears. A corset platysmaplasty with removal of fat, often called a Neck Lift or submentoplasty, is one way to accomplish tightening the deep layer below your chin while reducing extra fat. His version of the submental Neck Lift is the Neck-Lace which is step one of a Neck Lift or a standalone procedure for patients in their 20s or 30s who have a double chin. A submental Neck Lift alone will not tighten the skin and that is the drawback of using a Neck Lift alone to rejuvenate your neck. Dr. Moelleken’s patients from around the globe, across the nation, and locally in California have found that Neck Lift surgery can provide dramatic results, especially when combined with other facial rejuvenation procedures. Dr. Moelleken recognizes your confusion regarding the various styles of surgical facial enhancement and he does not try to apply just one type of surgery to the different types of facial shapes, wrinkles, and aging. Instead, he combines the best of all types of procedures and tailors them for your individual needs. He knows that everyone ages differently. Some clients have neck laxity, jowls, wrinkles around the mouth, weak cheekbones, loss of facial volume, tired eyes, heavy brows, or a combination of multiple features. Some people develop wrinkling and sun damage on their entire face and neck developing exaggerated signs of aging. Some people lose fat on their neck while others accumulate it even though they maintain good skin tone. Dr. Moelleken performs surgical facial rejuvenation by combining the exact amount of tissue lifting, wrinkle improvement, volume restoration, and laser skin tightening or resurfacing. There are many procedures available to enhance the appearance of your neck ranging from very minimal treatments with no down time to more invasive procedures requiring anesthesia and time off for recovery. With so many options to choose from, if you look in the mirror and do not like the way your neck looks the first step is to call Dr. Moelleken at Neo Surgery Center. Together, you will decide what is best to give you the most positive results and he encourages you to write down your thoughts on what you would like to correct so this can be discussed during your initial consultation. You should honestly tell Dr. Moelleken what you dislike about your neck because you are putting a lot of time and effort into researching your surgery and this will ensure you get the results you want. The blueprint for your exact procedure will depend on your desired outcome and your own personal circumstances. 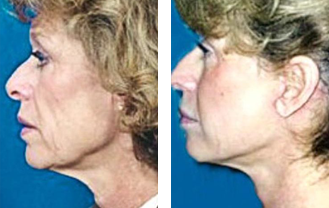 A Neck Lift provides a solution if you are searching to improve the appearance of your neck and under your jaw line. Today, men and women in their 50s and 60s are healthier and more productive than ever before and they are choosing to age gracefully by setting back the clock through facial cosmetic surgery. The fact is however, most people seeking facial cosmetic surgery want to look better but they do not want to look radically different. Dr. Moelleken feels strongly that the outcome of any facial cosmetic surgery he performs should produce a very natural appearance. He considers a great result is both what you see and what you do not see. Typically, a Neck Lift can set back the clock approximately ten years and although aging will continue, you will always look better for your age than if you had not had the surgery. Neck Lift procedures can be safely repeated in ten year intervals and the final results of your surgery may not be completely evident until several months after your surgery. The end result will be a long lasting, elegant restoration of youth that can make you look 10 years younger and allow you to love your neck once again. 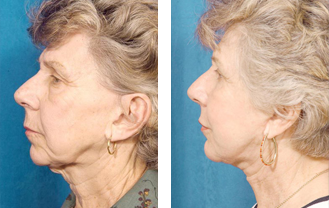 A Neck Lift is a surgical procedure designed to restore elegance to your face. Though your neck is not technically part of your face, a neck with loose and sagging skin can age your face dramatically. Also known as Cericoplasty or Platysmaplasty, so named for the plastysma muscles that run along the front of your neck, a Neck Lift tightens your skin and the underlying muscles to lift your neck as well as improve and sharpen the contour of your jawline. It is said that the eyes are the first place we begin to show our age but the neck is definitely the second area. Vertical banding, horizontal creases, fatty jowls, the dreaded “turkey-wattle,” and a crepe-like quality to the skin all work together to make us look much older then we really are. A neck lift will give you a smoother, more toned appearance to the skin under your chin and the neck area that has lost its elasticity. Immediately under the skin of your neck is the platysma muscle, which you can easily see in a mirror when you clench your teeth and tighten your jaw. When you are young, this paired muscle meets in the midline below your chin. As you age however, the right and left sides of the platysma often separate, producing vertical ‘cords’ in the anterior neck. The platysma can be divided anteriorly and tightened during Neck Lift cosmetic surgery to permanently eliminate these ‘cords’ and improve your neck contour. Once tightened in the midline below your chin, lateral traction on the platysma creates a ‘sling’, which elevates the soft tissues below your jawline. Whether you have acquired excess skin and fat beneath your chin as a result of genetics, advancing age, or weight loss, Neck Lift surgery can be the perfect solution for you. Dr. Brent Moelleken M.D., F.A.C.S., is regarded as one of the most talented Neck Lift surgeons in the world. He uses advanced surgical techniques and a unique theory of facial aesthetics to provide all of his Neck Lift patients with outstanding neck rejuvenation results. When performed by Dr. Moelleken, your Neck Lift surgery will deliver results that are truly remarkable while the final outcome will look completely natural. During your consultation, there are several issues that need to be determined by palpation and an exam for the best approach to help your situation. If you have extra fat, liposuction could help and if your hyoid bone is low, the angle can be improved to a point. If your platysma is loose, a plastysmaplasty should be considered and Dr. Moelleken’s version of interlacing platysmaplasty is called the Neck-Lace, a procedure he created. This technique helps increase the firmness of your neck just under your chin. As people age, many complain of a sagging neck and the necklace procedure involves a small incision just under your chin area and like the liposuction technique, deposits are taken out of your jaw. These deposits cause sagging and when removed, it improves the tightness of your neck skin. Dr. Moelleken believes that an experienced facelift surgeon can guide you through the decision making process because the right solutions will be apparent when each of the variables are explained to you. He realizes his patients are very intelligent and his goal is to educate you in every procedure to help simplify your choices as well as give you a better understanding of the entire course of action. Dr. Moelleken says that even if two patients look identical, they usually require totally different procedures.